The Good Wife not good enough? So… The Good Wife was not nominated for OUTSTANDING DRAMA and… I am actually shocked [and you know how I feel about TGW] (*). 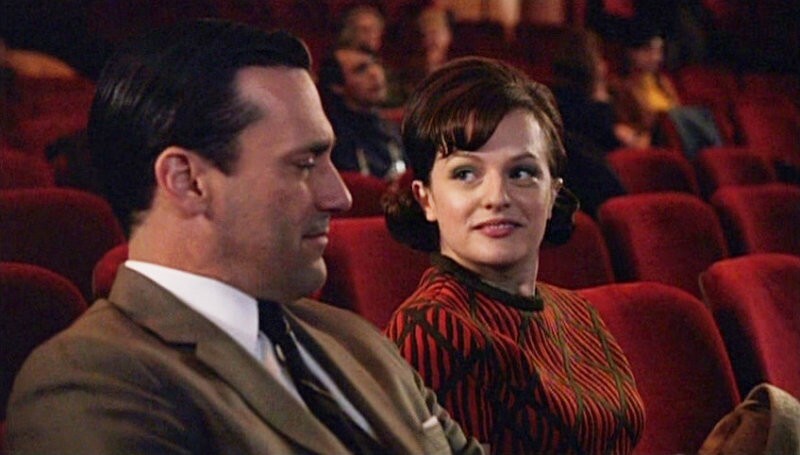 They still couldn’t resist nominating the actors in every single category, but the fact that TGW didn’t push Mad Men out is a win in my book. The Drama category was actually a good one with: Breaking Bad, Downton Abbey, Game of Thrones , True Detective, House of Cards and Mad Men. All incredible dramas that I love, although, I would say Downton is way past its prime and that slot should have gone to one of the underrated favs such us: Banshee, Sons of Anarchy, Hannibal or Orphan Black. Read this article on Vulture which got me thinking. 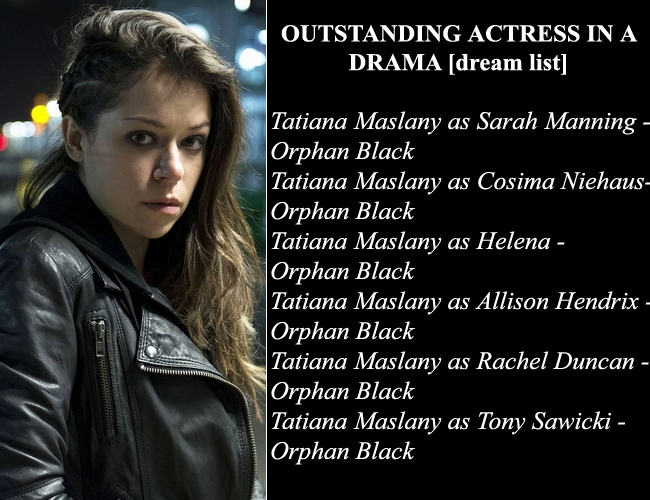 According to me, Tatiana Maslany should be a shoe in for any and every award ceremony, but she does have a few things against her. 1) She is a relative newcomer, and voters sure love their movie stars and established actors (Maggie Smith, Jeff Daniels, Don Cheadle, Jon Voight e.g.) 2) Orphan Black is a sci-fi show. And there has ALWAYS been prejudice against sci-fi. Somehow it is not considered serious drama, which I hate because I believe sci-fi can be one of the most effective vehicles for social criticism and character development but I am not an Emmy voter… If I were JOHN NOBLE WOULD HAVE AN EMMY! [Sorry apparently I am not over that either]. Same goes for the OUTSTANDING DRAMA ACTOR category. I would easily take out Jeff Daniels (The Newsroom) and replace him with Hugh Dancy from Hannibal [another CRIMINALLY ignored show]. Do not make me choose between Aaron Paul and Peter Dinklage… I CAN’T! It was Breaking Bad’s last year and Aaron Paul did an incredible job. Normally I would say this HAS to go to him. But as I have said many times before, Peter Dinklage should always be nominated and win this SUPPORTING ACTOR IN DRAMA awards and boy was this HIS YEAR. I’ve always thought he was incredible but this year he was on a different level and he had one of the toughest storylines of the season [and probably the show]. Many of his scenes will go on as classics… Seriously, let's watch the speech again... shall we? So? See my dilemma? It’s Breaking Bad’s last year… but it was also Tyrion’s year! I… I ca… can’t! Also, if these two didn’t exist I would say that Jon Voight was fantastic on Ray Donovan and deserved to win [and Walton Goggins SHOULD be nominated]. Damn… this is hard. As for OUTSTANDING SUPPORTING ACTOR IN COMEDY that is easy. I pick Andre Braugher… He better win! Finally I love seeing one of my favourite TV duos on the nomination lists: Benedict Cumberbatch and Martin Freeman. Both are nominated for Sherlock and Martin also has a LEAD ACTOR IN A MINISERIES OR MOVIE nod for Fargo. Sherlock is one of my favourite shows and I love that they don’t have plans to stop making it, even though the actors have become movie stars. And, Fargo was a great miniseries, and YES I liked it as much as the movie. That’s it… Breaking Bad better be the big winner and everything will be right in the world. I am also predicting that Orange is the New Black may win now that it is in the logical category! It IS a comedy not a drama like the Golden Globes suggested. (*) If you read my blog often you know I always complain about TGW being just a little overrated, but it’s one of my projects for the year to watch every single episode [I’ve honestly only seen a few, but enough…]. Maybe after watching everything I will become a die-hard fan and like it more than Breaking Bad? Yeah… I don’t think so, but stranger things have happened.